Researchers at the University have developed new methods to track stem cells and further understanding of what happens to them after they have been in the body for a significant period of time. Stem cells are used to treat conditions such as leukaemia and have the potential to treat many more diseases and disorders where patient survival is reliant on organ and tissue donation. Currently, however, it is difficult for medics to establish whether stem cells have survived following transplantation in the body and if they reach their target site or migrate elsewhere. In order to track stem cells in the body scientists use superparamagnetic iron oxide nanoparticles (SPIONs) to ‘label’ the cells before they are administered into the patient. These particles can be picked up by magnetic resonance imaging (MRI) scans and help medics establish if the stem cells reach their intended target. Conditions within the body’s cells, however, can lead to the degradation of SPIONs and reduce the ability of MRI scans to pick up on their signal in the long-term. Scientists at Liverpool are developing methods to visualise SPIONs in the cells before they enter the body to learn where the particles are going within the stem cell and help predict how they might perform once they are inside the body over a long period of time. 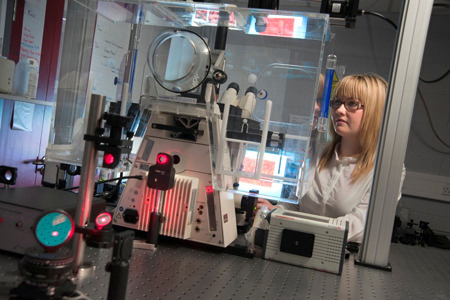 They are using a photothermal technique, a unique optical imaging system, to improve SPION labelling so that particles survive for longer and have minimal impact on the function of the transplanted cells. Dr Lara Bogart, from the University’s Institute of Integrative Biology, said: “Stem cells have the potential to replace and repair damaged tissue to preclude the need for a patient to wait for an organ or tissue transplant. Research is ongoing into how it could be used to treat a wide variety of diseases such as Alzheimer’s, Parkinson’s disease, and type one diabetes. “In order to fully explore this potential, however, more technological developments are needed to understand how stem cells behave in the body after transplantation. If we can’t monitor stem cells effectively, it can have serious implications for patient health. Studies have already shown that if cells migrate to the circulatory system, beyond their target organ or tissue site, then it can cause inflammation in the body. The research, supported by Engineering and Physical Research Council (EPSRC), is published in the journal, ACS Nano. The full article can be accessed here. Great stuff – well done! Looking forward to future developments!